We knew we wanted to make Chicago one of the stops on our cross-country road trip, but we also knew we would have limited time to see it all. So, we strategically planned out the best things to do in Chicago that we could do in just one day to make sure we hit everything on our must-see list. We decided to get a hotel in downtown Chicago so that we could get up early and start the day exploring the Windy City. And it was…windy that is. The forecast called for 40 mph wind gusts throughout the day. 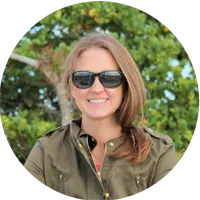 I put on multiple layers and headed out the door and was still stung by the cold wind! If this is only October, I can’t imagine what January weather is like! Nevertheless, there were thousands of people walking the chilly streets of Chicago on this cold morning. I guess you get used to it! Even though the downtown hotels are more pricey, if you want to maximize your time here, it’s a good idea to splurge for one. We stayed in the La Quinta Chicago downtown, which was very convenient to the Chicago Loop area. The only complaint I have is that it was very difficult to stay in the city with our two dogs. While the hotel allows dogs, there is literally no grass to walk them on! The only option near the hotel is a little mulch-lined flower bed on the sidewalk. It was very awkward letting our dogs do their business in the flower bed while hundreds of people walked by on their way to work. To make matters worse…Linkin was experiencing some diarrhea and couldn’t make it to the nearest dog park. But, if you’re not traveling with pets it’s best to stay downtown if you can. 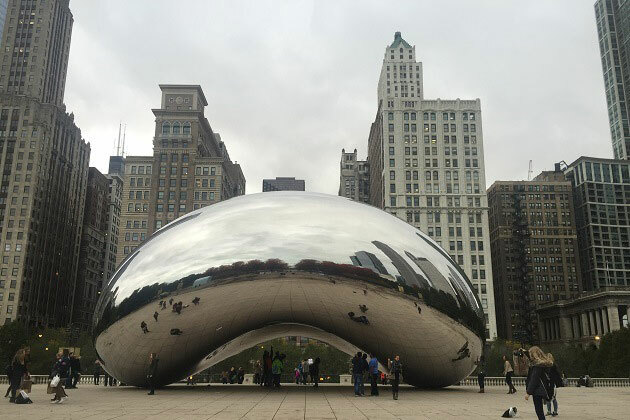 A walk through Millenium Park to see the Cloud Gate (aka “the bean”) is an absolute must when you visit Chicago. The one good thing about the cold crappy weather was that there weren’t many people there. I can imagine that on a warm summer day, this park gets packed. 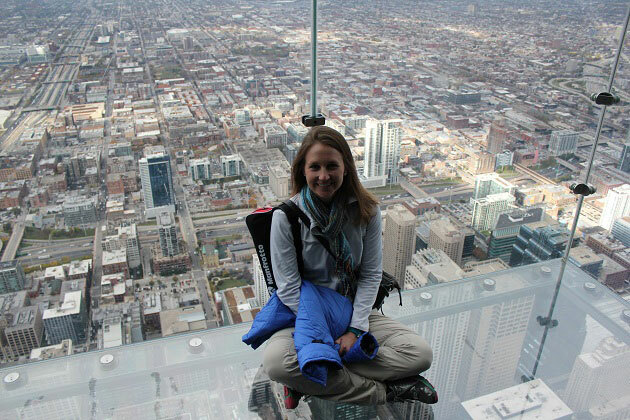 It’s quite a far walk from Willis Tower, but doable. If you don’t want to walk, taxis are everywhere throughout the city and can quickly get you there. 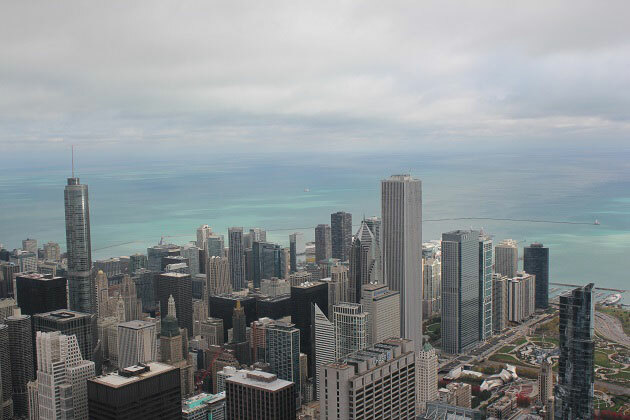 Be sure to walk down the Magnificent Mile, another short walk from Millenium Park. Even if you don’t like to shop, the huge department stores and boutiques give you a taste for upscale Chicago. 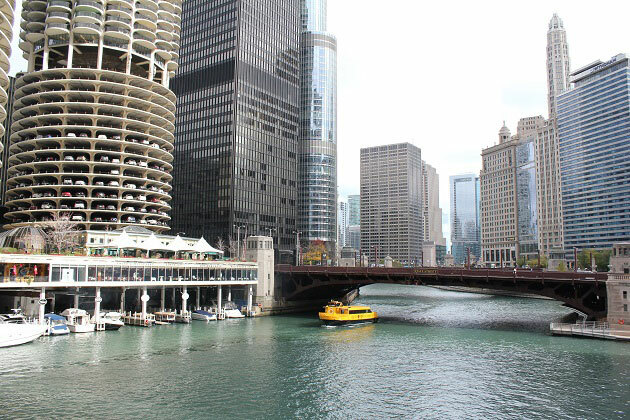 Plus, you’ll also get to walk over the Chicago River which is neat to see. Very close to the Magnificent Mile is the Navy Pier. I was a little bummed that most of the attractions on the pier were closed for the season, but the indoor shops, restaurants, and garden area were nice to walk around. We ended up eating there at Giordano’s Pizza the night before when we arrived. Their Chicago style deep-dish stuffed pizza was incredible! 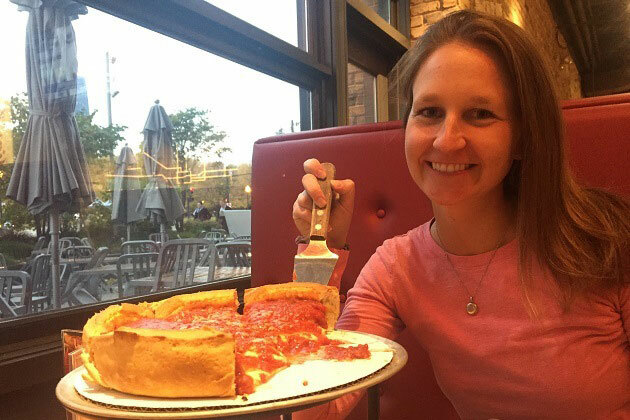 If you are looking for a good Chicago-style pizza, It was delicious! If you’re a baseball fan (or an American) then a visit to Wrigley Field should be on your list. Plus, down near Wrigley Field, you MUST stop at Molly’s Cupcakes for one of their famously delicious stuffed cupcakes! My sister recommended this place to me after she visited Chicago and I knew I had to go. She is a cupcake queen and if she says they’re good then I’m in! They were also featured on the show Cupcake Wars, so they’re kinda a big deal. 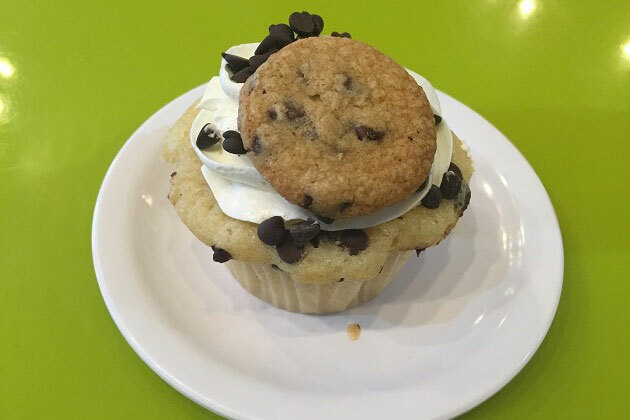 🙂 I had the cookie monster cupcake and this cookie-dough filled cupcake was the best I’ve ever had. Seriously….go! And, one last food recommendation is Portillo’s Hotdogs. I am actually not a hotdog eater, but my husband got the chili hotdog and was raving about how good it was the rest of the day! If you’re not a hotdog fan like me, they also have many other options including pastas and salads that looked incredible. The downtown Chicago location is convenient if you are already there, but they have many many other locations around Chicago where you could stop for a bite on your way out of town. After eating my way around Chicago with deep dish pizza and cupcakes, I am in serious need of a food makeover. 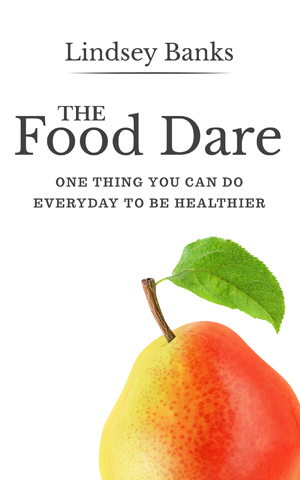 I plan to start The Food Dare on Nov 1st to get back on track! 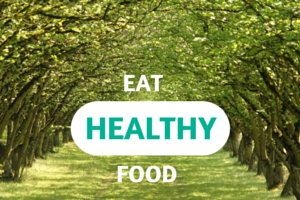 I’d love for anyone to join me here and become a member of The Food Dare Team so we can support each other! This road trip is not over yet! We’re only about halfway through! Tomorrow we head to Cleveland, OH! Stay tuned! Looks like you hit all the great places! And Giordanos is my absolute favorite for deep dish here. It was prob the coldest it’s been yet this weekend so sorry the weather was crappy when you came! We were able to see a lot in such a short time! Hopefully next time I will have a little more time and we can meet up! Hi Loretta! Thank you so much for following!